Who wouldn't love to receive this beauty? The heavy duty calypso bay, enamel colanders alone are worth some oohs and ahhs. 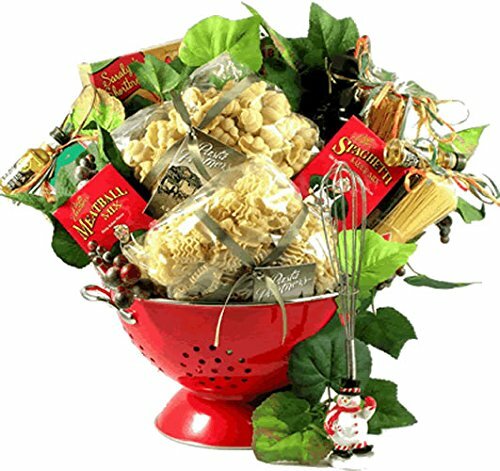 Especially when it arrives artfully arranged with an abundance of delicious gourmet Italian specialty items, such as: 3 quart red enamel colander metal whisk 16 ounce gnocchi artisan pasta 12 ounce sun-dried tomato basil linguini 13.25 ounce Italian pasta salad zesty Italian meatball mix marinara sauce blend sun dried tomato and herb bread dipper seasoning mix extra virgin olive oil focaccia crisps Tuscan crackers crunchy Romano garlic cheese sticks trimmed with grapevine ivy and topped with a designer bow, this large and spectacular gift will be a big hit for any occasion.